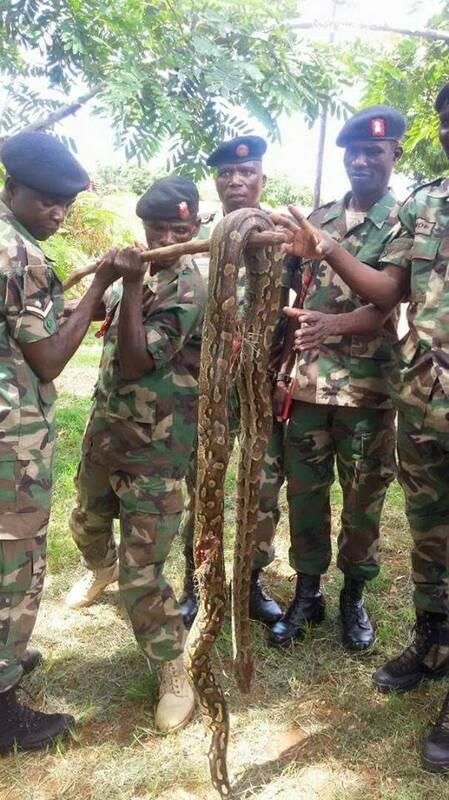 A python snake has met its sudden justice after it visited Malawi defense soldiers` battalion in Dowa. The incident is said to have happened last week at Mvera support battalion in Dowa district. A tiny report says, one woman had reported to the soldiers around the area that the deadliest snake was killing her chickens. In help of the woman, the soldiers took steps to help the worrying lady by killing the python. It is reported that it was killed with 10 live bullets. It was 3.7 in length and weighed over 15 Kg`s. However, there hasn’t been any official communication from the MDF.